Just a note to say thanks for the trip down memory lane with your hatbox article (“Brimming With Style,” November 2014). My wife and I pulled Grandma’s Peck & Peck boxes out of the basement … and found two perfect boxes and three great-looking hats! They looked like something out of the [HBO] show Boardwalk Empire. There is no better time, or better views, than a fall color tour in a hot air balloon (“Floating Over Fall,” October 2014). Magical and breathtaking. After being featured in your magazine (“Taking Root,” November 2014), this was the next greatest thing that happened to us: Busch’s Fresh Food Markets picked up our products. Thank you to for covering our Kick Off Party at Mike’s on the Water (“Party Pics,” hourdetroit.com) and for all your continued support! 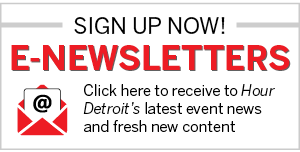 // A huge thank you to DIFFA Dining by Design Detroit’s Media Sponsors: Hour Detroit, Between The Lines newspaper, Flame Magazine, FOX 2 Detroit, and CBS Outdoor Detroit. Thank you for always being a good friend to Michigan AIDS Coalition! So proud of Olympic gold medalists Charlie [White] and Meryl [Davis] (“The Golden Touch,” November 2014). They are great examples to show what hard work and dedication can accomplish. Previous articleTake This Job and… Change It?